AAMCO of Ypsilanti is a full-service auto repair and preventive maintenance center serving Ypsilanti and Ann Arbor, Michigan. While we’re independently owned and operated to bring you exceptional local customer service, we’re also proud to be part of a more significant national presence, granting us the resources and overhead to succeed. 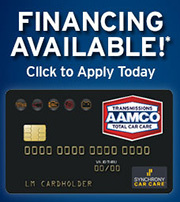 Since 1963, AAMCO car care centers have serviced over 20 million transmissions. Featuring some of the best-trained auto technicians in the industry, we have over 20 years of experience working on new cars and over 50 years’ experience in the automotive industry as a whole to bring you some of the best customer service available. We staff only expert-level technicians with years of experience, so you always have a reliable person working on your car. We’re so confident in our maintenance technicians that we guarantee our work. Because we believe that you deserve the best value when you take care of your car, all of our auto repair services in Ypsilanti and Ann Arbor, MI, come with a minimum of a one-year warranty. By combining quality work, warranties, and guaranteed low prices, we’re confident you’ll come back for years. Give us a call today to schedule an appointment for service and don’t forget to ask about our available specials and financing options designed to make your auto repairs even more affordable here. We’re in the business of taking care of you to get you back on the road quicker and safer. As recognized automatic and manual transmission experts in the industry, AAMCO of Ypsilanti provides complete transmission service and maintenance services, as well as transmission flush and filter services. Conveniently located in Ypsilanti, we offer free inspections on cars, trucks, and SUVs of all makes and models. You can always expect excellent service, quick service, and helpful advice when you entrust your auto repair to our highly-qualified auto service technicians. © 2019 AAMCO of Ypsilanti. All Rights Reserved.